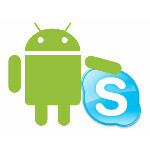 Skype for Android has been updated to version 2.6 which adding and polishing a number of features. This update comes just a bit over two months since Skype 2.5 hit the Android Market. As far as compatibility and performance, the Skype team has been hard at work making video and battery usage better on Tegra 2 devices like the Motorola XOOM or Motorola ATRIX. Additionally, the team has been testing various handsets for video performance, and this time around are giving their stamp of approval for the HTC Amaze 4G, Motorola DROID 4 and DROID RAZR. There have also been some tweaks to the UI and voicemail. The biggest addition in this update is the ability to now send photos or video to your Skype contacts, you know, just in case your relatives have Skype, but not e-mail. It's certainly a nice addition, and makes things a bit more efficient, but it's not a killer feature by any means. Just a matter of making Skype more fully functional really. If you don't have Skype or want to update, it's available for free in the Android Market.